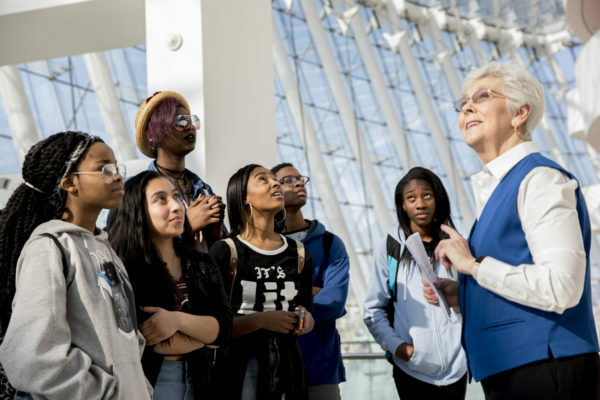 More than 60 students and chaperones visited the Kauffman Center on April 10, 2018 as part of the Kauffman Center’s Open Doors Spotlight on Youth program. Visitors from Prep KC and Pleasant Lea Middle School in Lee’s Summit participated in a number of activities throughout the day, including tours through the Kauffman Center’s stages and lobby spaces. High school audiences from Prep KC enjoyed a hands-on lighting lab demonstration from the Kauffman Center’s Audio Production Supervisor, Donna Miller Brown. Students had the opportunity to learn about how light patterns are chosen for performances while also testing their skills with adjusting lights and applying filters and gels. After a sound design presentation and a tour through Helzberg Hall, Prep KC students visited with Kauffman Center staff to learn about careers in the performing arts management field, including marketing, fundraising, accounting, ticketing services, and volunteer management. Later in the day, middle school students from the Lee’s Summit school district took a behind-the-scenes tour of the Kauffman Center stages. They also previewed a lighting demonstration before participating in a Q&A about backstage work at the Center. 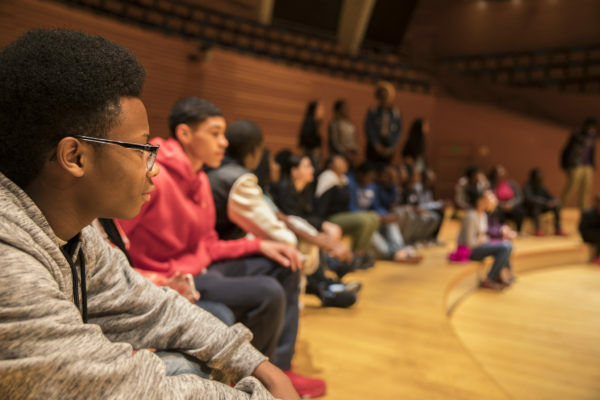 The Kauffman Center’s Open Doors Spotlight on Youth program will continue engaging students in a wide range of tailored experiences at the Center, including tours, internships, backstage workshops, and discussions with administrative staff. To learn more about Kauffman Center opportunities for educators, schools, and students visit kauffmancenter.org/open-doors.